Tarun Kalra is a principal at Next World Capital. HR software has followed this playbook with many HR 1.0 platforms almost exclusively focused on the enterprise opportunity. Yet, HR 2.0 innovators enjoy a second beneficial competitive reality. In 2012, the dominant HR 1.0 vendors were acquired — Taleo by Oracle, SuccessFactors by SAP and Kenexa by IBM. As a result, HR 2.0 is stepping into a landscape largely devoid of independent 1.0 vendors. BetterWorks, Checkr, Culture Amp, Greenhouse, Grovo, Gusto, Justworks, Lever, Namely, Reflektive, SmartRecruiters and Zenefits are a few examples of HR 2.0 innovators that received Series A financings between 2012 and 2015. It’s no surprise that these emerging companies, which have forward-looking entrepreneurs and strong VCs, have recently stepped in. Together, the enabling dynamics and entrepreneurial community have converged to usher in the first widespread wave of SaaS 2.0 innovation against an established SaaS category. 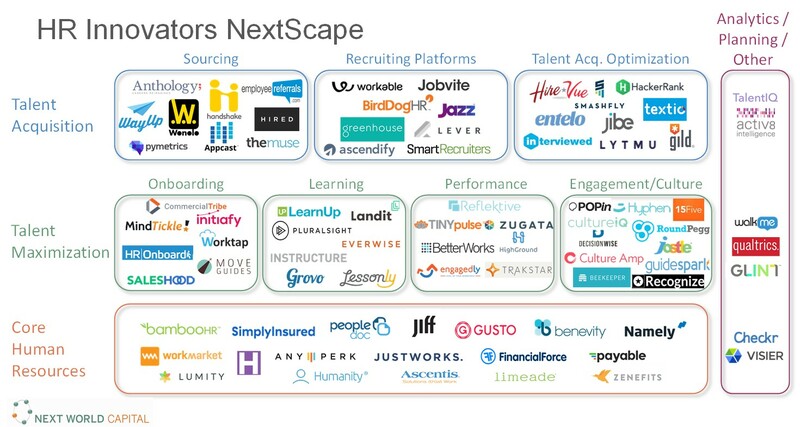 At Next World, we actively track 80+ HR SaaS players within our HR Innovators’ NextScape. This NextScape is not exhaustive, but rather focuses exclusively on players that are driving the HR 2.0 wave. We break down the market into the core HR functional areas of talent acquisition, talent maximization and HR administration. With innovators still commanding a small fraction of HR spend and new market entrants continuously emerging, we are perhaps in the second inning of this wave. Given the sheer breadth of activity, consolidation is inevitable. New market entrants must carefully consider the mission criticality and depth of workflow and use cases that they subsume. However, the foundations are in place for a new breed of enduring HR SaaS platforms. Their continued momentum will bolster the entrepreneurial community’s willingness to attack other established SaaS categories.